Instant response from a 32-bit RISC chip for more realtime potential The Roland XP-80 is a new music workstation developed along the concept of instant response and more realtime operation. A complete rethink of the music workstation, the XP-80 streamlines operational flow and increases comprehensive music workstation power, effectively handling everything from music production to live performance, without compromise. The 32-bit RISC chip exercises optimal control over all the new XP-80 features. Like a newly developed MRC Pro sequencer system that is highly advanced, yet allows spontaneous operation to maintain your creative flow. And a sound source that is equivalent to the acclaimed Roland JV-1080, providing superb sound quality, advanced functions and maximum expandability. The XP-80's advantages synergistically combine to establish a new reference standard for music workstations in terms of sheer expressiveness, performance scope and operational versatility. 32-bit RISC chip enables instant response The XP-80's main CPU is a 32-bit RISC chip for lightning fast and accurate response to performance data. Using this chip places all workstation operational flow under advanced central processing control. Onboard high-performance MRC Pro Sequencer The XP-80 incorporates a new MRC Pro sequencer that expands and advances editing functions of the industry-standard MC-series sequencers. Emphasizing realtime production to accommodate today's musical applications, the MRC Pro promotes off-the-cuff production and performance that maintain your creative flow. The MRC Pro features 16 phase traces, each capable of controlling up to 16 MIDI channels, plus a tempo track. Access to more sounds than ever before Many of Roland's latest waveforms are included to give sounds more impact. The XP-80 can accept up to four SR-JV80 series wave expansion boards at one time, to significantly boost the internal memory. There are 10 Tone structures including two wave generators, time variant filters (TVFs) and time variant amplifiers (TVAs) as well as a ring modulator and booster. To aid in creating sounds, a full battery of high-quality effects are provided including eight reverbs, one chorus and 40 insert effect, like phaser and distortion. The 61-note XP-50 is an integrated workstation which benefits from the same standard setting synth engine found in the JV-1080 Super JV Synthesizer Module. 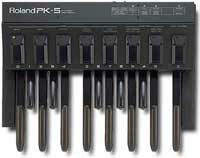 Massive 64-voice polyphony, 16-part multitimbral capabilities and Roland's acclaimed 32-bit RISC chip processor provides integrated sequencing, arrangement and synth layering possibilities. Expansion slots accommodate any four of the SR-JV80 series expansion boards simultaneously. The MRC-Pro sequencer has enhanced functions and a collection of new and improved performance features. 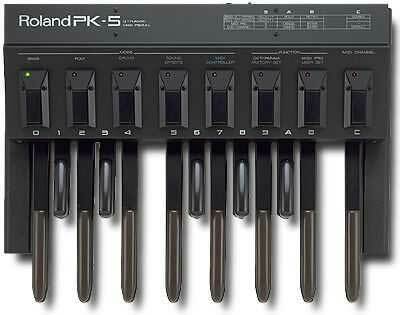 The PK5 is a midi foot controller with easy one foot operation.